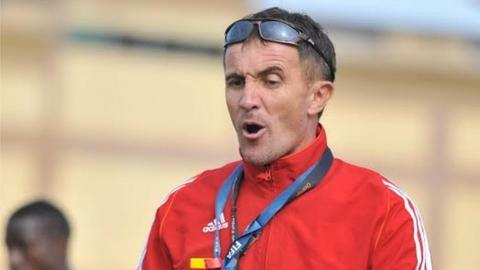 The Federation of Uganda Football Associations (Fufa) has said that it is working on clearing the salary arrears owed to the national team coach Milutin 'Micho' Sredojevic. Sredojevic, who on Sunday lead the Cranes to their first Africa Cup of Nations finals since 1978, complained on social media about not being paid. Fufa admits it owes the coach and says paying him is a priority. The association added it is meeting with the coach to resolve the issues. Fufa also explained that much of its recent income had been used to ensure the "the success of the team" in their final must-win Nations Cup qualifier against Comoros. The statement continued: "Fufa is committed to ensuring all his salary arrears are cleared and we are confident this will be handled." The coach has also said that he is prepared to take the matter to football's world governing body Fifa if necessary.